Leonard Bernstein (1918-1990) was an American composer and conductor who wrote both classical and popular music in many styles encompassing symphonic and orchestral music, ballet, film and theatre music, choral works, opera, chamber music and pieces for the piano. As a composer of Broadway musicals he collaborated with the lyricist theater giants Betty Comden & Adolph Green, Stephen Sondheim, and Alan Jay Lerner. In 1957 he composed the music for the groundbreaking musical West Side Story which was the first modern musical adaptation of Shakespeare's Romeo and Juliet. The screen version of West Side Story won the Academy Award for best picture in 1961, but the original stage musical lost the 1957 best musical Tony award to another great musical, The Music Man. Bernstein was the premier conductor and Music Director for the New York Philharmonic during the 1960's and ultimately produced over 400 recordings. He received a dozen Grammy awards, a Distinguished Achievement Tony award in 1969, the Handel Medallion (New York City's highest honor for the arts) in 1977, the Kennedy Center Honors in 1980, the Gold Medal from the American Academy of Arts and Letters in 1981, the National Fellowship Award in 1985. and the Premium Imperiale international prize awarded for lifetime achievement in the arts in 1990. 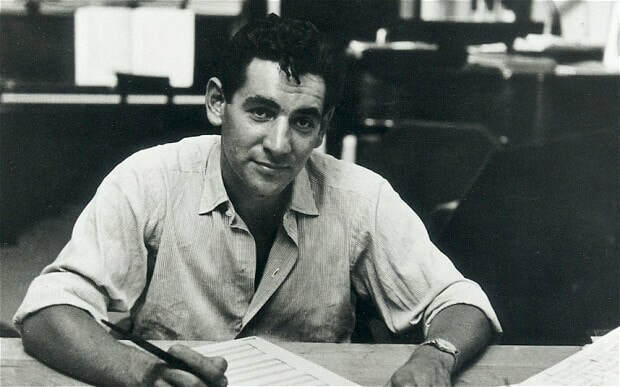 Leonard Bernstein (known as Lenny to his friends) was born Louis Bernstein in Lawrence, Massachusetts and was called Leonard early on by his parents, changing his name officially at the age of 15. For the first 25 years of his life he studied piano, conducting, and composing at Harvard, the Curtis Institute of Music in Philadelphia, and Boston Symphony Orchestra's Tanglewood, resulting in an Assistant Conductorship at the New York Philharmonic in 1943. His father eventually supported his musical aspirations and when asked about his reluctance early on he replied: "How was I to know he would become Leonard Bernstein?" For the next 20 years Bernstein lived in New York City, composed some of his best known works, and in 1958 became the Music Director and premier conductor of the New York Philharmonic. His musical works included the ballet Fancy Free 1944, the operas Trouble In Tahiti 1952 and Candide 1956 (featuring the songs "It Must Be So" and "Make Our Garden Grow"), the stage musicals On The Town 1944 (featuring the songs "New York, New York", "Lucky To Be Me" and "Some Other Time"), Peter Pan 1950 (featuring the songs "Who Am I" and "Build My House"), Wonderful Town 1953 (featuring the songs "It's Love" and "Ohio"), and West Side Story 1957 (featuring the songs "America", "I Feel Pretty", "Maria", "One Hand, One Heart", "Somewhere", and "Tonight"). Additionally he worked on the screen versions of On The Town (1949), On The Waterfront (1954), and West Side Story (1961), and composed various choral, chamber, and piano works. His compositions were of a complex musical quality which included many different time signatures, and different key changes. He was also known for using varying degrees of modulation (key changes to refresh) between verses of the same song, and ingenious methods of transitioning between the modulations. A prime example of this is his song "Tonight" from West Side Story where each verse uses part of the bridge to correctly modulate down one full note. Most modulations go up, not down, and the pleasing result in "Tonight" is a tribute to Bernstein's genius. After leaving the New York Philharmonic Directorship in 1969, he spent the rest of his life as Conductor Laureate, teaching and lecturing, composing classical works, recording, and conducting orchestras throughout the world. In the early 1970's he collaborated with the theater giant Alan Jay Lerner on a musical celebrating the United States 1976 bicentennial. Lerner's libretto, ultimately titled 1600 Pennsylvania Avenue, contained many historical presidential stories, and even though this final Bernstein stage musical was a flop, it produced one of Bernstein's most delightful and complex melodies "Take Care of this House". Just prior to his death in 1990 at the age of 72, Leonard Bernstein used the Premium Imperiale $100,000 prize money to establish The Bernstein Education Through the Arts fund (BETA), dedicated to developing arts-based education programs. This philanthropist legacy is still in operation today and has resulted in dozens of educational programs for the arts.